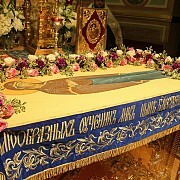 On August 27-28, the feast of the Dormition of the Holy Thetokos, the Administrator of the Patriarchal Parishes in the USA led the Divine Services in St. Nicholas Cathedral in New York City. 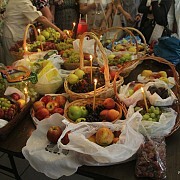 On Sunday August 21, the afterfeast of the Transfiguration and Sts. 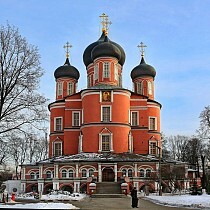 Zosima, Savatey and Herman of Solovki, the Administrator of the Patriarchal Parishes in the USA, His Grace Bishop John of Naro-Fominsk led the Divine Liturgy in St. Nicholas Cathedral in New York City. On Friday, August 19, following Divine Liturgy, the Administrator of the Patriarchal Parishes in the USA, His Grace Bishop John of Naro-Fominsk, led the Funeral service for the newly-departed world-renowned sculptor, Ernst Neizvestny (in Holy Baptism - Julian) in St. Nicholas Cathedral. 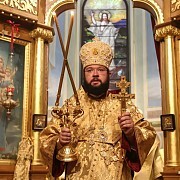 On Sunday, August 7, the Seventh Sunday after Pentecost, the Divine Liturgy in St. Nicholas Cathedral in New York City was led by the Administrator of the Patriarchal Parishes in the USA, His Grace Bishop John of Naro-Fominsk and the chairman of the Moscow Patriarchate's Department for Institutions Abroad, His Grace Bishop Antony of Bogorodsk. 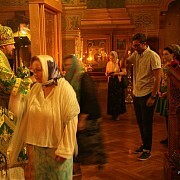 On Monday, August 1, the feast of St. Seraphim of Sarov and the second anniversary of his consecration to the episcopacy, the Administrator of the Patriarchal Parishes in the USA, His Grace Bishop John of Naro-Fominsk celebrated the Divine Liturgy in St. Nicholas Cathedral in New York City.